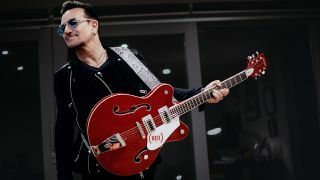 Gretsch and U2 star Bono have launched a special (RED) edition of the double-cutaway 5623 Electromatic to raise funds for the global fight against AIDS, tuberculosis and malaria. The guitar, which is optimised for high-gain playing, features a spruce centre-block inside the bound archtop, thinline body. Tone-wise, the guitar is kitted out with a pair of 'Black Top' Filter'Tron pickups with conventional three-position switching plus master tone and volume controls. It also promises to be as playable as other guitars from the Electromatic range, with a 22-fret bound rosewood neck featuring vintage-vibed thumbnail inlays. The retro-theme continues in the hardware spec, which equips this sharply styled guitar with Grover Deluxe tuners, 'G' cutout tailpiece and anchored Adjusto-Matic bridge. Five per cent of proceeds from the sale of these special-edition guitars goes towards the (RED) charity, co-founded by Bono and philanthropist Bobby Shriver in 2006, which has so far raised $275 million for the Global Fund to fight AIDS, tuberculosis and malaria. www.red.org.